Brazilian legend Luiz Felipe Scolari has been sacked as manager by Chelsea after "deteriorating" results and performances, the Premier League club announced on their Web site on Monday. The decision follows Saturday’s goalless home draw against Hull City that has left the west London club fourth in the table — seven points behind defending champions and league leaders Manchester United. Chelsea’s Web site statement read: “Luiz Felipe Scolari has been dismissed as manager of Chelsea Football Club with immediate effect. You say: Were Chelsea right to dismiss Scolari Who should replace him “The Chelsea board would like to place on record our gratitude for his time as manager. “Felipe has brought many positives to the club since he joined and we all feel a sense of sadness that our relationship has ended so soon. “Unfortunately the results and performances of the team appeared to be deteriorating at a key time in the season. “In order to maintain a challenge for the trophies we are still competing for we felt the only option was to make the change now. “The search for a new manager has already started and we hope to have someone in place as soon as possible. “While that continues assistant coach Ray Wilkins will take charge of the team on a pemporary basis.” The 60-year-old Scolari, who won the 2002 World Cup with Brazil, took charge at Stamford Bridge last July after leading Portugal at the Euro 2008 finals. He became the fourth manager of the Roman Abramovich era following Claudio Ranieri, Jose Mourinho and Avram Grant and speculation has already started over who will be the fifth incumbent. 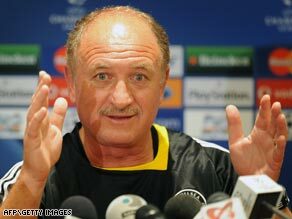 Scolari enjoyed plenty of success as a club manager in Brazil and was wanted by the Football Association to take charge of England in succession to Sven Goran Eriksson.